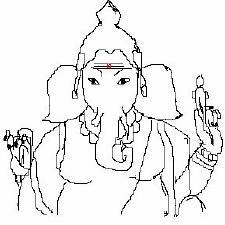 Ganesha, Ganapati, Pilliyar, Vinayaka, Who Is Lord Ganesha? 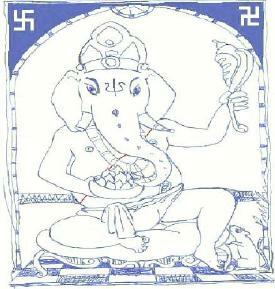 Drawing by Bill Who is Ganesha? Read updated version of this page here. Presented in three parts, the story of how Ganesh became half- elephant half- man, the meanings derived from this story and questions about Ganesh. Siva said he did not know anything about Ganesha, but had come in by beheading the man guarding the door! Parvathi wailed and shouted, "How can you kill our only son!??" At that time, Siva knew what damage he had done. And Parvathi asked him to bring Ganesha back to Life. Siva said, "How can I do that? His head is severed and can not be reconnected!" Parvathi agreed that Siva should take the head off of the first living being in the area and attach it to the body of her son, so that he could live. Siva had saw one elephant, and beheaded that elephant and attached that head to his son. These are following questions some have asked me regarding Lord Ganesha. 1. Why do I like Lord Ganesha? At one time, I was only curious about Hinduism, and considered myself an atheist. But something happened to me. I visited a Hindu temple. At the time it did not strike me much more than a new and exciting experience. But sometime later, visions of Ganesha came to me in daytime, waking hours and in my sleep. I had many dreams of Ganesha in different forms. I never had visions or dreams of God before this one of Ganesha. In one such dream, Jesus also came. It was quite a revelation for me. I pray to many Gods, of Hinduism and Christianity, but somehow Ganesha is always there for me, to help me overcome my obstacles. 2. How can you see a person with an elephant's head as a God? God comes in many forms and shapes, I feel this form of God has great powers as any other God. 3. How do you worship this God? Ganesha is the 'remover of obstacles,' so one should pray to him before starting any new journey. That is why he is at the entrance to my home, so that you will enter with a clear mind. And when I pray to him, I pray to him as I do to any other God, with devotion (bhakti), sincerity, and affection. 4. Has this 'God' ever done anything for you? Yes! He has saved me. Some say that before meeting Jesus, they did not know what or who God truly is, but I was lost and I found Ganesha. Now I know what God truly IS. 5. When you pray to this God, what do you pray for? I pray for anything as you also pray to God for, my family, friends and personal health and happiness. 6. Because you pray to Lord Ganesha, are you a Hindu? Yes! But Hinduism, truly is not a religion, it is a way of Life. Even atheists can be Hindus! It depends on how you live your life. However, it must be said that to pray to any Hindu god or goddess, one does not have to become a Hindu to do so. 7. I know Hindus worship a LOT of gods and goddesses, how many do you worship? Ganesha is the FIRST and preferred God, but I also worship Balaji (Sri Venkataswara), Murugan (Ganesh's brother), Banashankari Devi (a form of Parvathi), Siva, and Lakshmi. 8. That seems like a lot of Gods to pray to, are you sure they all work for you? Yes! Really all Gods are One. Even in my puja (prayer alter) I have a photo of Jesus. Jesus, too is a form of God, and has contributed in a meaningful way. It is just that some see God as One, where as others can see God is One, but having many forms. (Read the philosophy of Ramakrishna to understand.) All want to reach God, it is just how we do it differs, but my way is not wrong, and your way is not wrong, either! This page was created in April 2000. Updated June 2004, August 2007, January 2009. This page has been visited times since September 2001.